In October of 2011, Pogue’s OS X 10.7 Lion Missing Manual was published and now, less than a year later, the OS X 10.8 Mountain Lion version has been released. This is no small feat; these books are 900 pages in length. Manuals tend to be bone dry but Pogue’s sage wit shines through these Missing Manual pages, making them easy and fun to read. Entertaining, even. 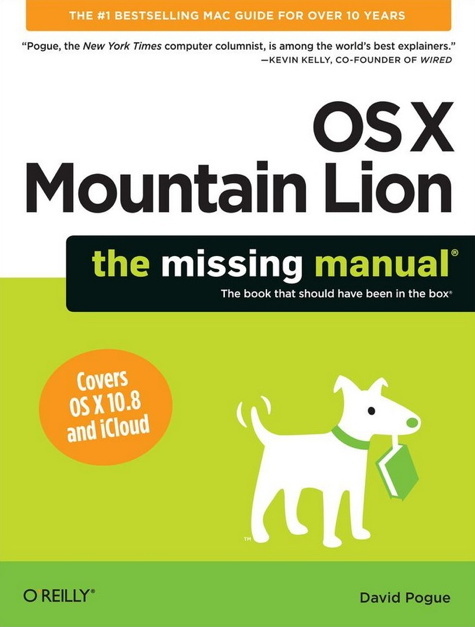 OS X Mountain Lion: the Missing Manual is not a volume you’ll ever need to read from cover to cover. Rather, it is an indispensable reference that belongs on your bookshelf so that when an OS X question arises, you’ll have the answer close at hand. The leap from OS X Snow Leopard to Lion was huge. It presented many new ways of interacting with the Mac operating system and it heralded the beginning of the gradual integration of iOS into the Mac OS. The step up to Mountain Lion this year is more evolutionary and isn’t quite so much of a jump. In fact, the new Mountain Lion book is twenty pages shorter than the Lion volume—nonetheless, it still weighs in at a hefty 882 pages. Pogue carefully explains the various installation processes and then proceeds on to the big, new features of Mountain Lion: Notification Center, dictation, documents in the cloud, iMessages, Gatekeeper, the VIP concept in Mail, and more. He covers the basics in uncomplicated, simple terms so that even a novice will get a clear picture. Even so, he doesn’t skip any of the geekier, power user features such as file-sharing with Windows, VPN connections, screen sharing, and the like. I’d like to have seen a few What’s New in Mountain Lion pages at the beginning of the book. For those making the step up from OS X 10.7 Lion this would be a quicker start. The new features are covered in the index, but having them discussed briefly as part of the introduction would have been helpful. The reason that Pogue’s books are so popular is because they’re approachable. Even those who don’t usually read manuals will appreciate these. His books are brimming with helpful hints and tricks that you can choose to adopt or not. When presenting one of his tips Pogue says, “Depending on your point of view, this tip is either a shortcut or a detour.” Fair enough. You simply cannot go wrong buying this book. It belongs on your reference shelf. Novice or pro, you will learn a substantial amount about your new operating system from it—and, have fun in the process.